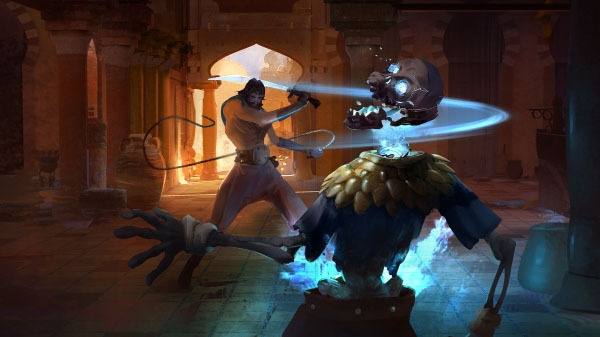 Uppercut Games was generous enough to offer the Gigamax crew a beta key to try out their latest Rogue-Like game, City of Brass. This Indiana Jones meets Bioshock adventure was something special from the very beginning. The environments and simplistic gameplay mixed with sneaky traps and dangerous enemies kept things interesting every step of the way. City of Brass may be simple at heart but the level design is spectacular. It begins with the character spawning in and it’s all on from there. With no quests or missions, the goal is to make it to the end of the level and advance to the next stage. Each stage is riddled with booby traps, skeleton enemies, and treasures beyond your wildest dreams. The treasure is used to purchase upgrades from the genies located throughout the map. Players have an objective arrow that will guide them to the end of the level, they’re also timed so it’s important to keep moving. This hidden gem of a game didn’t get much attention by the media. This is surprising considering it was developed with the help of ex-Bioshock developers. Overall the game came out great and the Gigamax crew is excited to keep on working their way through the unique levels and fight the bosses along the way. There’s no telling what other secrets are hidden throughout the City of Brass. As any fan of Rogue-like games knows, there is always a new, exciting experience to be had. Be sure to stick around as the Gigamax Crew continues adding to this exciting games playlist. Both Gigs and Mack can’t wait to jump back in and see what else the City of Brass has to offer. Thank you so much for taking the time to watch and for visiting GigamaxGames.com. It really does mean the world to us. If you can think of any way we can improve the content, please let us know at GigamaxGames@gmail.com. Also, if you have a game you want to watch us play, just reach out and we’ll jump right on it!